To help gain perspective and set realistic expectations of handmade tile, I often say artisan tiles are like the strokes of an Impressionist painting or hand woven rug. When you closely look at the stroke or weave, you will see color variation and the design motif itself may not be perceptible or clear. Step back though and the blended imperfection of the artist's hand creates a stunning work of art. Our modern-day world has created an affinity for perfection. We are so used to seeing everything crafted to such tight tolerances that glossy productions are de reguer. 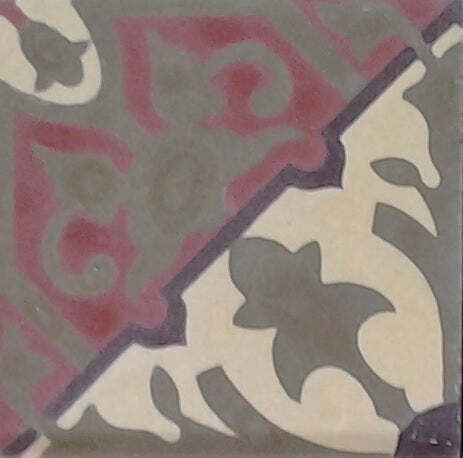 One of the most common questions I hear when people receive their first sample or order is that the "The cement tile is not perfect" in some way. Handmade Cement Tile will have slight imperfections. We want our installation to look like that bistro in Paris or Hacienda in the Yucatan. 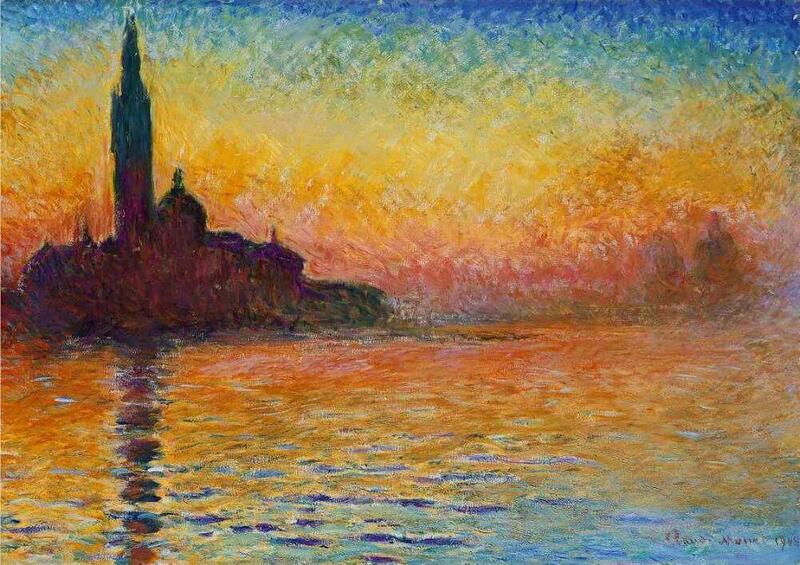 The truth is that the imperfections are there; but, the beauty of the pattern and variation in color allow your eye to see the same thing you see when you look at a Monet or Seurat. 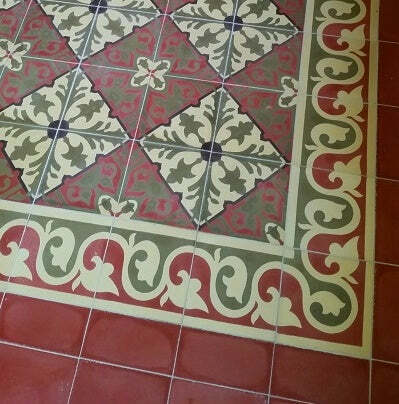 The beauty of cement tile is in the variation and slight imperfections. I do enjoy sharing this journey of discovery with folks unfamiliar with cement tile, or encaustic cement tiles as they are often called. I've been working with a customer in Denver on a design. She discovered our Cuban Heritage Design CH110-2B pattern and while she liked the colorway, it just wasn't right for her. I explained that the colors for that pattern are easily changed using any color from the Heritage Color Palette. However, this process takes time – we are talking design here. The best place to start is with color chips so you can create a cohesive design and really see the colors. A few weeks after receiving her chips, she had found the right colors and had us create several renderings to see what worked best. 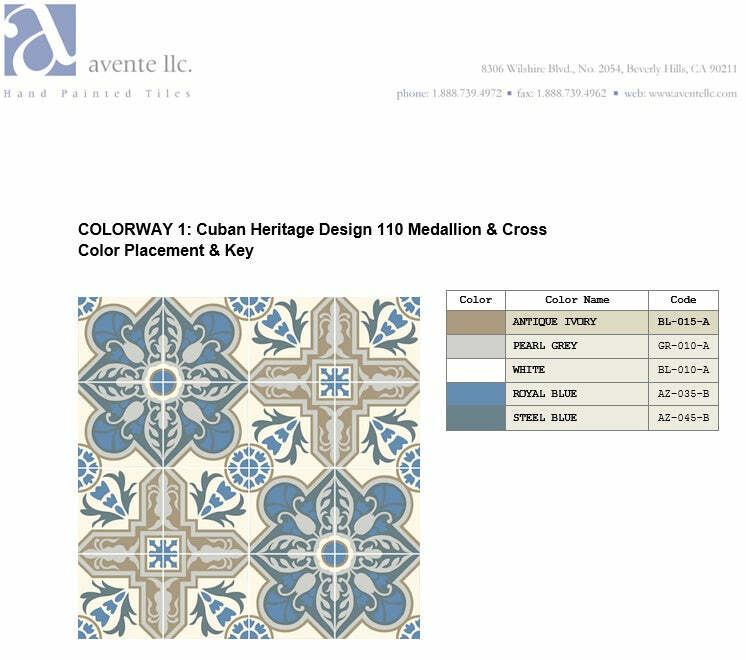 A sample of one rendering that Avente provided using the customer's color choices. Color substitution are never easy; but, I was impressed with the colors she selected and loved the different choices. This design-inspired Denver homeowner found the renderings the ideal way to find what worked best and ordered strike-offs or sample tiles of the rendering that she like best. We received our strike-off samples. As expected we love the design and are so pleased with the color combination! 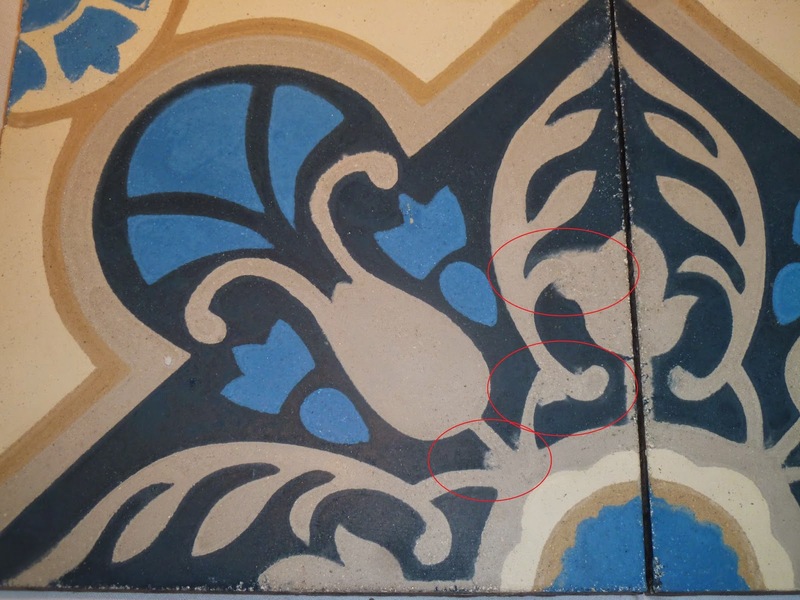 Given the tiles are handmade, we did expect some slight variation from tile to tile – minor blemishes or color bleeding, lines not matching up perfectly. Photo of customer's strike-off with slight color variation and line widths. However, can you comment regarding this particular tile (see below)? Is it representative of the typical quality we should expect? We are concerned. Pattern lines on tiles should be crisp. I can see why she was concerned. In my efforts to set reasonable expectations for a hand made tile, I had neglected to explain that strike-offs samples may not always have the most crisp pattern lines because it takes time to get the metal mold to settle and work with the frame. I think your expectations for cement tile are correct – which means I've done my job. The variation in color and slight imperfections you find in the first set of images are to be expected. The blurred pattern and edges in the second set of images (with red circles) should not be expected in the full order. The primary goal with strike-offs is to confirm color acceptance for the pattern. The problems you see in the second set of images occur in strike-offs because we can’t make enough tiles and fine-tune the process that allows the mold to settle. I hope you have enjoyed understanding how the hand of the artist creates a unique look in cement tile and the importance of quality in custom design. Never stop asking questions because they provide the clarity to ensure you are buying a top-notch product. 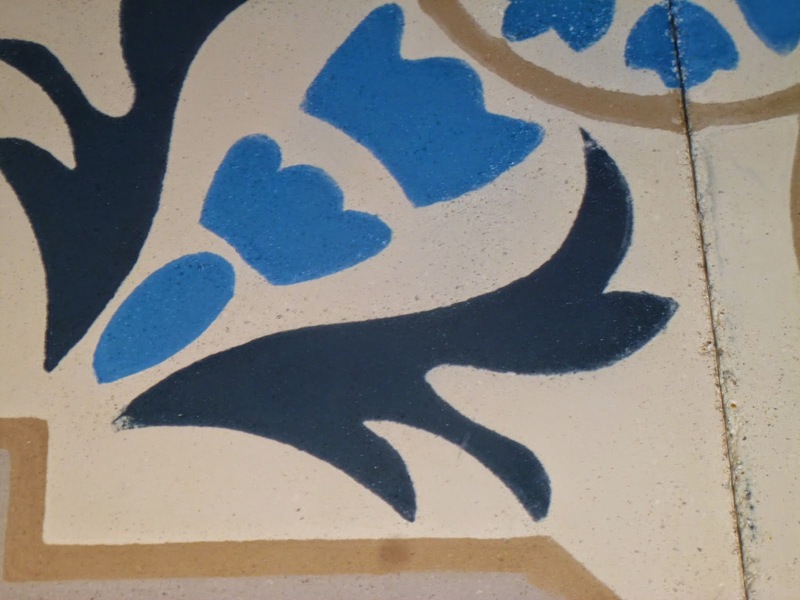 If you enjoyed today's post on custom cement tile design and what makes a high quality tile, you might also enjoy our Avente Tile’s Guide to Buying Handmade Cement Tile to learn more about this amazing product.